Christmas is a special season for kids young and old, in homes and offices in and around the Northwest Houston / Cypress area. Of course, the Jolly Old Elf ... Santa Claus ... is a big part of the season. Pick the right Santa, and you have a hit on your hands. Santa Jim is a Real Bearded Santa. Make a mistake in picking a Santa and you miss a chance that won't be back again. Santa Jim is a hit at home visits ... neighborhood association / corporate / office events ... public appearances ... or anywhere your family and friends gather. You want to have a Santa with a real beard who not only 'plays' the role ... butIS the Real Santa! That is why Real Santa Jim is the only choice when planning your holiday event. He is safe, sober, and reliable. 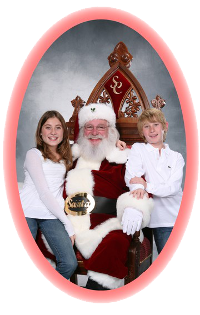 He is a professional Santa Claus who loves to entertain kids and adults alike. And, Santa Jim shows up with Mrs. Claus. She complements the Santa visit by helping with the kids, helping with photographs, and helping with navigating Santa's Sleigh through and around the streets of Houston. Santa would be lost without her as the Reindeer only fly on Christmas Eve! Oh, when available, Santa Jim and Mrs. Claus show up with their grandkids who also play Sugar and Spice ... their special Elves. See other photos of the Elves elsewhere on this webpage. Take note of the Santa Throne in the photo. This is a beautiful hand-carved mahogany chair available for your special event.